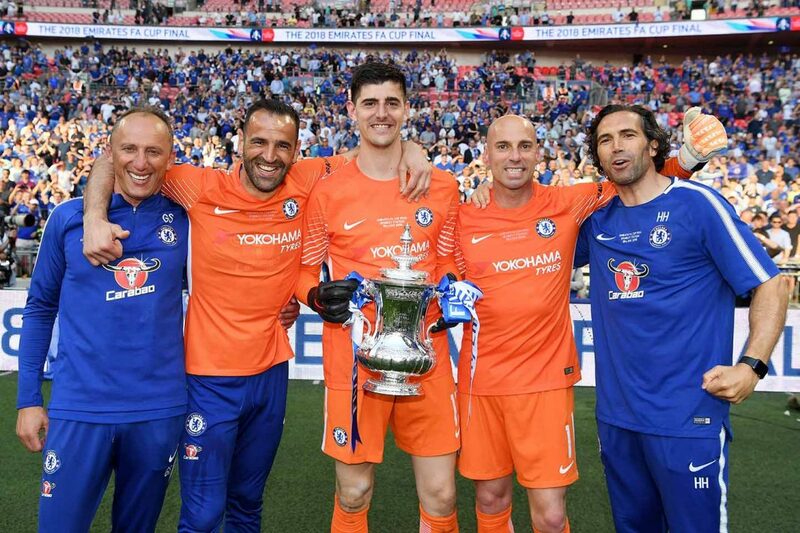 Goalkeeping coach Gianluca Spinelli, Eduardo of Chelsea, Thibaut Courtois of Chelsea, Willy Caballero of Chelsea, and Henrique Hilario, assistant goalkeeping coach pose with the Emirates FA Cup trophy following their sides victory in The Emirates FA Cup Final between Chelsea and Manchester United at Wembley Stadium on May 19, 2018 in London. Chelsea host Championship opposition at home for the second round running in Sunday evenings FA cup fourth round tie against Sheffield Wednesday. Chelsea come into the match on a high after defeating Tottenham on penalties on Thursday night to book our place in the league cup final next month. The players responded well to Maurizio Sarri’s call to arms after the defeat at Arsenal, and Sarri got his team selection and tactics spot on against Tottenham. This raises questions over the starting line up against Sheffield Wednesday. Wholesale changes were made to the team for our victory over Nottingham Forest in the previous round. Will Sarri do likewise here? It’s probably likely given the fixture congestion we have at the moment. Having played on Thursday, and with another midweek game next week away at Bournemouth its likely rotation will happen. Emerson has been included during the league cup run and in the previous round, but his inclusion here could be an indicator as to Sarri’s thinking moving forward regarding the left back position. Sarri replaced the out of form Alonso with Emerson against Tottenham and the Brazilian full back performed well. Should Alonso return to the side against Sheffield Wednesday it would perhaps be an indicator that Emerson would start in the league match midweek. Ampadu is likely to feature. He lined up in midfield against Forest, but could also partner Christensen in the centre of defence on Sunday. One much anticipated change will most likely happen up front. This will be the first match that new signing Gonzalo Higuain is eligible for. Hopefully he can start his Chelsea career on a positive note. Hudson-Odoi is also likely to get a start in the front three. Visitors Sheffield Wednesday lie seventeenth in the Championship. Such is the tightness of the division that they are only nine points off seventh place however. They have two wins, two draws and a defeat from their last five league matches, including a 1-0 win last time out at home to Wigan, and an impressive 0-1 win at Middlesbrough. They beat Luton Town after a replay to reach round four. This will be the first fixture between the sides for nineteen years. Sheffield Wednesday won the last meeting 1-0 at Hillsborough. That was their only win in the last thirteen meetings however. Despite such a long gap between fixtures, Sheffield Wednesday have been regular opponents during our history. The sides have met 123 times, with the Sheffield side edging the head to head record with forty-one wins to our thirty-seven. The draw has been the most repeated outcome between the sides. In fact seven of the last thirteen matches have ended level. There is fairly extensive FA cup history between the two sides, with sixteen matches between them in this competition. The propensity for these sides to play out a draw also extends to the worlds oldest cup competition. Astonishingly of the nine occasions the sides have been pulled out of the hat together, on six occasions a replay has been required. In 1939 it took two hundred and seventy minutes to split the sides, with Chelsea finally progressing from the fifth round tie in the second replay at Highbury. Ironically we had beaten Arsenal there in the league only two days previously. Perhaps this extensive match time (six matches over twenty one days) resulted in our defeat at home to Grimsby in the sixth round. The most famous period of FA cup history between the sides took place over three consecutive seasons. Before we won the cup for the first time in 1970, we came close on several occasions. Reaching two consecutive semi finals, followed by defeat in the 1967 final. Sheffield Wednesday ended our hopes in the 1966 semi final played at Villa Park with a 2-0 win. Goals from Graham Pugh and Jim McCalliog, who had been in the Chelsea squad that also lost 2-0 at this stage the previous season against Liverpool scored the goals. The following year we exacted our revenge with a Tommy Baldwin goal enough to knock Wednesday out at the quarterfinal stage at Stamford Bridge. We then defeated Leeds in the semi, before losing 1-2 against Tottenham in the final. We continued to show a liking for a cup run, going out in the quarterfinals the following year against Birmingham, having despatched Wednesday in the fifth round. When we have faced Wednesday and progressed we have often gone far in the tournament, including in the season when we last met, 1998/99. A Di Matteo goal knocked them out at Hillsborough before we lost after a replay against Manchester United in the quarterfinals. The following year we would win the trophy thanks to a Di Matteo goal in the final against Villa. Let’s hope that if we can win this seasons fourth round fixture we will go on another long run in the competition, albeit with a winning end.